Bloomberg is out with a fascinating look at how America uses its land for various purposes in the lower 48 contiguous states, based on extensive data published in 2017 by the U.S. Department of Agriculture. By grouping each color, we have can see wide "bands" of land use by color. 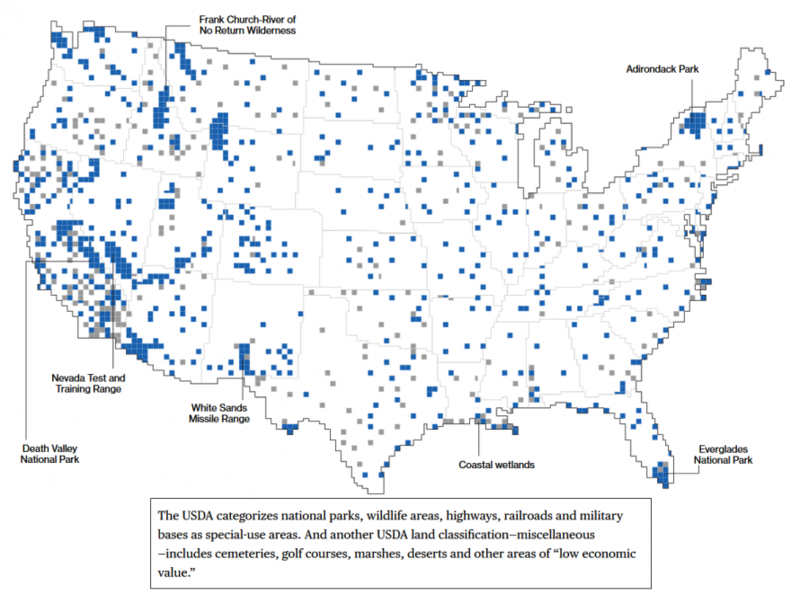 Of note, Special Use areas are categorized as national parks, wildlife areas, highways, railroads and military bases. The U.S. is becoming more urban—at an average rate of about 1 million additional acres a year. 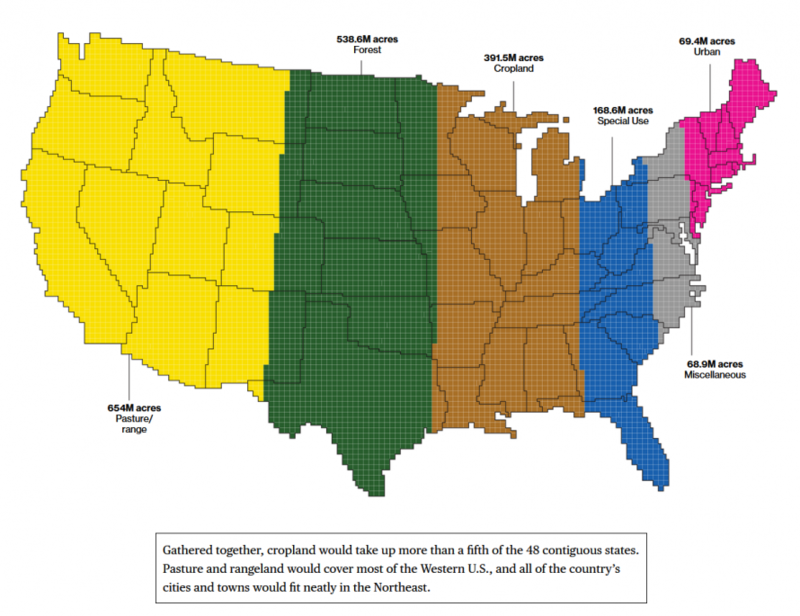 That’s the equivalent of adding new urban area the size of Los Angeles, Houston and Phoenix combined. 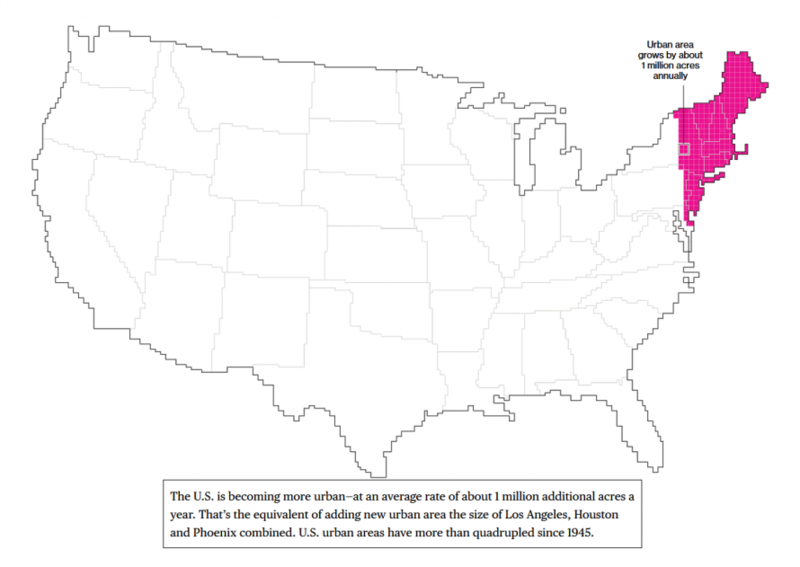 U.S. urban areas have more than quadrupled since 1945. More than 100 million acres of special-use areas are park and wilderness areas, where most commercial activities, such as logging, mining and grazing, are excluded. 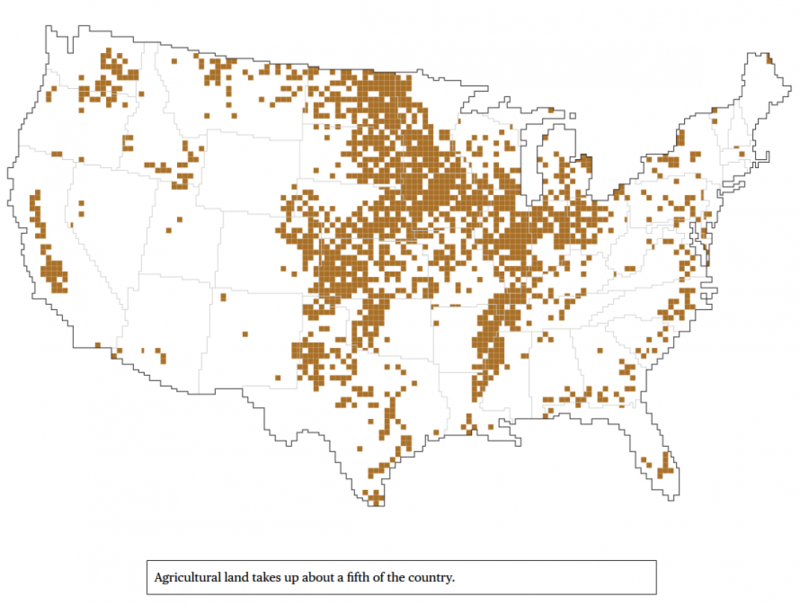 Agricultural land takes up about a fifth of the country. 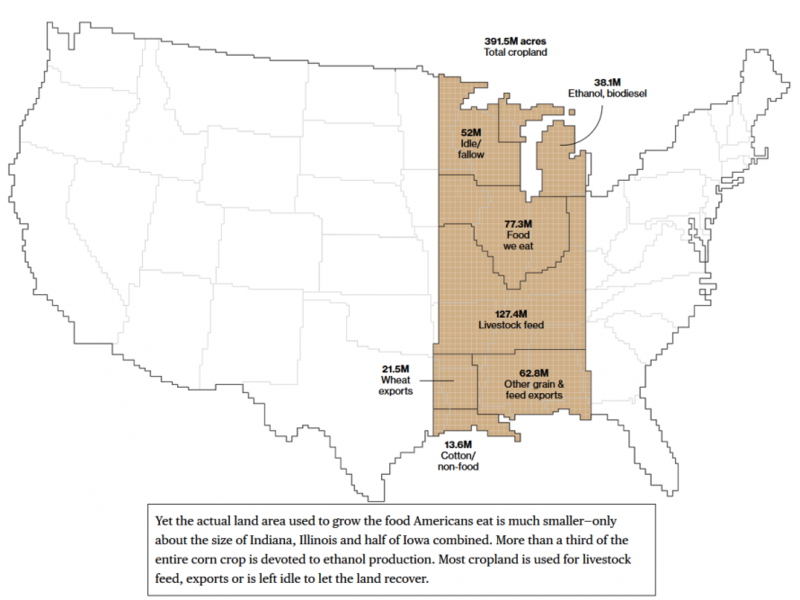 Yet the actual land area used to grow the food Americans eat is much smaller—only about the size of Indiana, Illinois and half of Iowa combined. More than a third of the entire corn crop is devoted to ethanol production. Most cropland is used for livestock feed, exports or is left idle to let the land recover. While the U.S. benefits from an overall agricultural trade surplus, Americans imported 15 percent of their food and beverage products in 2016. More than 30 percent of the fresh fruits and vegetables Americans consume come from other countries, predominantly Mexico and Canada. 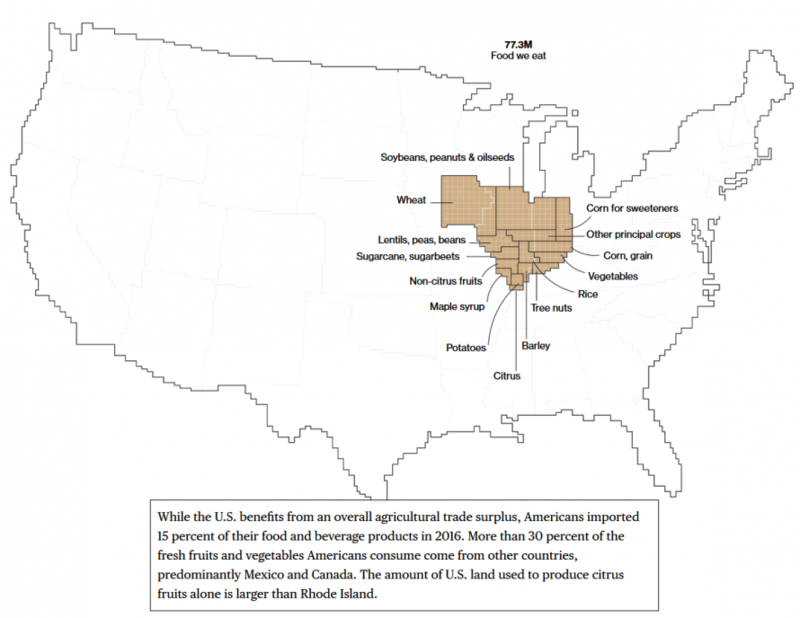 The amount of U.S. land used to produce citrus fruits alone is larger than Rhode Island. More than one-third of U.S. land is used for pasture—by far the largest land-use type in the contiguous 48 states. And nearly 25 percent of that land is administered by the federal government, with most occurring in the West. That land is open to grazing for a fee. There’s a single, major occupant on all this land: cows. 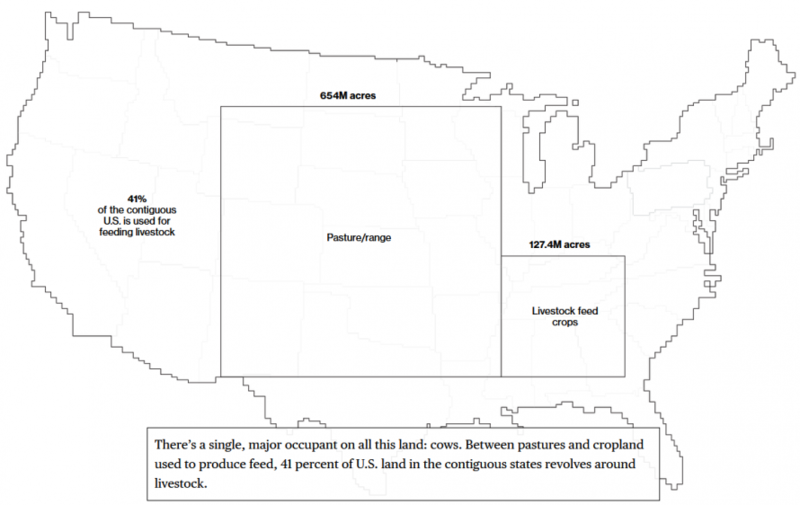 Between pastures and cropland used to produce feed, 41 percent of U.S. land in the contiguous states revolves around livestock. 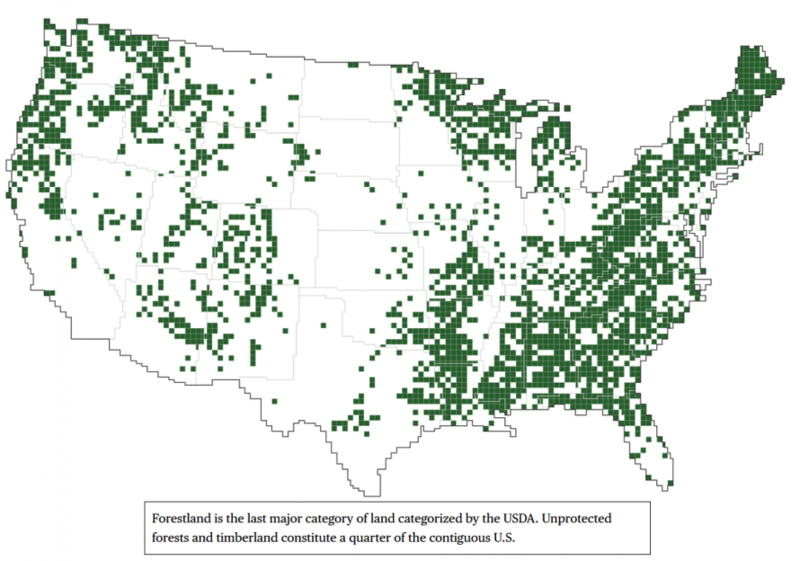 Forestland is the last major category of land categorized by the USDA. 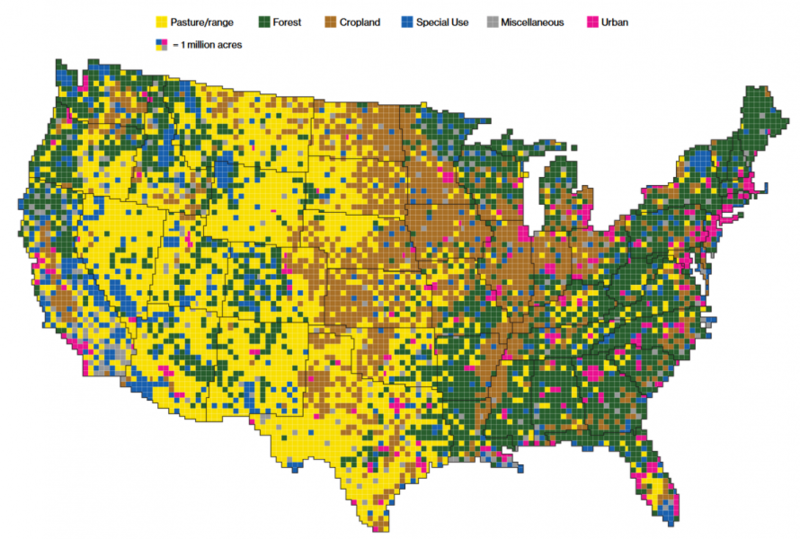 Unprotected forests and timberland constitute a quarter of the contiguous U.S. According to the U.S. Forest Service, timber harvests typically occur on about 11 million acres each year. But because of regrowth, the volume of U.S. timber stock grew by about 1 percent annually from 2007 to 2012. Weyerhaeuser Co. is the largest private owner of timberlands in the U.S. With 12.4 million acres, the company controls 2.3 percent of all commercially available timber, an area nearly the size of West Virginia. 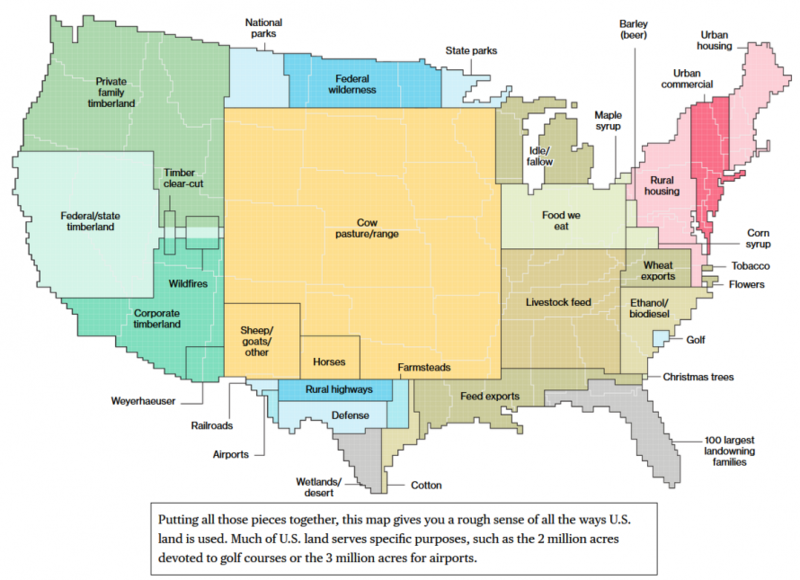 Putting all those pieces together, this map gives you a rough sense of all the ways U.S. land is used. Much of U.S. land serves specific purposes, such as the 2 million acres devoted to golf courses or the 3 million acres for airports. Methodology Land use classifications are based on data published in 2017 by the U.S. Department of Agriculture’s Economic Research Service in a report called the Major Uses of Land in the United States (MLU). Data from the report provide total land-use acreage estimates for each state across six broad categories. Those totals are displayed per 250,000 acres. Data from Alaska and Hawaii are excluded from the analysis. 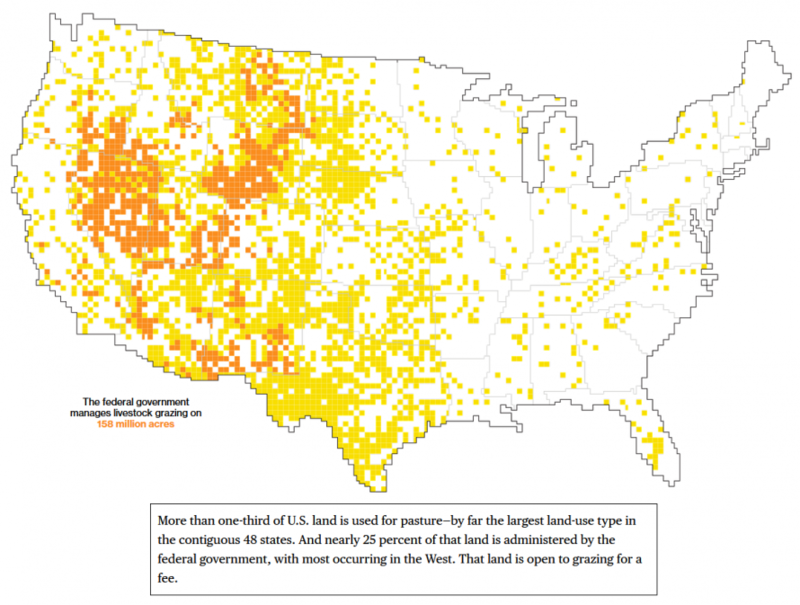 Special-use land and forestland make up the biggest land types in those states. Bloomberg referenced the USDA data against estimates from the National Land Cover Database to generally locate these categories within each state. Miscellaneous uses are defined as wetlands, rural residential lands, non-harvestable forests, desert, tundra and barren land of low economic value. Unlike all other land-use categories in the USDA data, a component breakdown for miscellaneous uses by state is not provided in the MLU. To locate miscellaneous areas, Bloomberg referred to the National Land Cover Database to generally calculate and locate acreage by miscellaneous uses. “Rural residential lands” in the USDA data make up most of the 69 million-acre miscellaneous-use category. This category does not equally correlate to data in the National Land Cover Database, so Bloomberg subtracted the total of the other miscellaneous components to arrive at a rough estimate of “rural residential lands”—about 50 million acres. Total pasture/range areas are proportionally divided by animal group based on National Agricultural Statistics Service livestock counts. Data showing the 100 largest landowning families are based on descriptions of acreage and land type in The Land Report magazine. Representative amounts of acreage were subtracted from private timber and cropland/range to show this category, which is not a part of the USDA data.